Those crazy muppets are back again in the season 3 release of The Muppet Show. 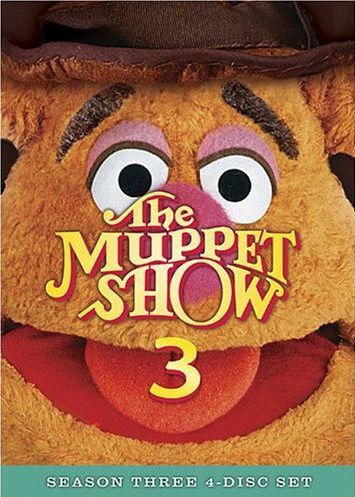 The basic premise and format of the show remains the same as seasons 1 and 2, with each episode featuring a real live special guest who interacts with the Muppets in various sketches, most of which are song and dance numbers. In between the performances are short little skits, and Kermit seen backstage trying to keep the whole show together. The Muppets features a lot of physical slapstick style humor as well as a bunch of one-liners, some which are funny but most which are only mildly amusing. All of the Muppet stars return such as Kermit the Frog, Miss Piggy, Fozzie Bear, Gonzo, Rowlf, Scooter, Dr. Bunsen Honeydew and Beaker, the Swedish Chef (bork bork bork! ), Sam the Eagle, and the list goes on and on. One of my favorite skits is the one with Dr. Bunsen Honeydew and Beaker, where Dr. Bunsen Honeydew makes some outlandish invention which somehow always ends up severly hurting poor Beaker. Pigs in Space is another that I constantly laughed through. But really, the show is about the guest stars. Like the previous season, I only recognized a handful of the celebrities. The one I was really looking forward to seeing in this set was Alice Cooper, though unfortunately that episode turned out to be a disappointment. I didn't care for any of this musical performances, and the spooky theme of the episode just didn't translate into any laughs. The episode I most enjoyed, surprisingly, was Raquel Welch. I heard the name before, but didn't really know who she was. Besides being a very hot woman and great performer, she also has some good comic timing. Liberace, whom I had never knew was actually a real person, was also pretty good. Oddly enough, most of the episodes that featured comedians were not as funny as the ones featuring the more typical song and dance performers. Another funny and memerable episode is the one with Lynn Redgrave. I don't recall every hearing the name before, but the episode is more focused than most, with a central theme of Robin Hood that plays throughout the entire episode. I loved the town crier joke, where he yells five o'clock and all's well... except for a long list of things that aren't... and that it's actually only 4:30. That was probably the best joke of the season! At any rate, you don't really have to know who these guests are to enjoy the humor, though I'm sure it would help in some instances. Anyone who is a big fan of the Muppets would surely love this set, and kids would probably like it to, but for me it was just some mildly enjoyable entertainment.